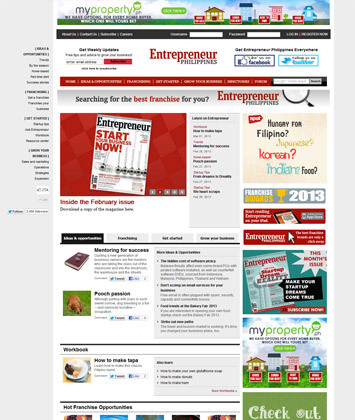 Entrepreneur.com.ph is a one-stop resource website for the aspiring Filipino entrepreneur. The site provides users a comprehensive and up-to-date listing of franchise brands and suppliers as well as guides on how to launch and expand your startup. The franchise directory lists local and international franchise brands in the Philippine market costing from as low as P20,000 pesos to millions. The supplier directly lists companies that small business entrepreneurs will need to run their companies. These range from food to furniture and equipment suppliers. This section gives tips and advice to aspiring entrepreneurs on how they can earn extra money, manage their business better and save cost.